Thinking back to the first few weeks after the birth of my son, one of the things I remember the most was the constant hunger once my milk came in. I think I remember it mostly because it felt so strange to go from not feeling hungry (or rather, feeling like I had absolutely no space left in my body for food!) to being absolutely FAMISHED. I’m so grateful to my mum and husband for keeping me well fed, and for all the friends that dropped off ready-made, healthy food, because I needed it! Seriously… Breastfeeding is no stroll in the park. Feeding a newborn every 2-3 hours requires a whole lot of fuel! Now that I know what to expect, I have been prepping for this next baby by making and freezing healthier, homemade versions of all my favourite treats that can sit for extended periods at room temp — energy balls, 2-ingredient fudge, dark chocolate peanut butter cups (can you tell I like chocolate? ), granola bars, and cookie dough bites! Making these treats myself means that I can get more specific about ingredients. Filling up on lactation-promoting (a.k.a. lactogenic food) and supplements can’t hurt when your sole mission is producing milk to feed a baby! Brewer’s yeast is a lactogenic food that’s full of vitamins important for breastfeeding. It’s high in B vitamins, and contains phytoestrogen, polysaccharides, chromium, and protein. Brewer’s yeast is great for boosting milk production, but can also help your energy levels and keep you feeling emotionally balanced. Find it in powder or tablet form at your local health food store. Oats are a fantastic lactogenic food, because they contain tryptophan, polysaccharides and saponins — A substance that helps with hormone production in the body. If you plan to add more oats to your diet, I recommend choosing reputable organic options whenever possible, as the non-organic oat crops have been known to contain glyphosate — also known as the Monsanto weedkiller Roundup. 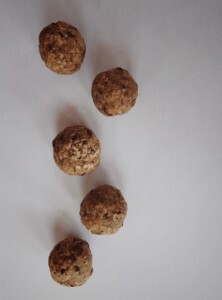 I try to keep dates stocked in my pantry at all times… they’re great on their own as a snack but also fantastic as a natural sweetener (I regularly make a batch of date paste for baking purposes), in smoothies and in energy balls. Dates are full of tryptophan, so they are great for boosting milk production. I’m a huge fan of the many benefits of dark, leafy greens in my every day diet, but greens can help reduce the any swelling and water retention from pregnancy, and some greens (spinach, watercress) contain tryptophan, putting them in the category of lactogenic food. Like dates, almonds are a great snack on their own, but can also be a fantastic addition to healthy treat recipes, both in their whole form, or as almond butter or almond milk. Almonds are a good source of protein, calcium, healthy fats, and tryptophan. There are plenty of other food sources considered lactogenic, but these are some of my favourite ingredients to work into snack recipes. 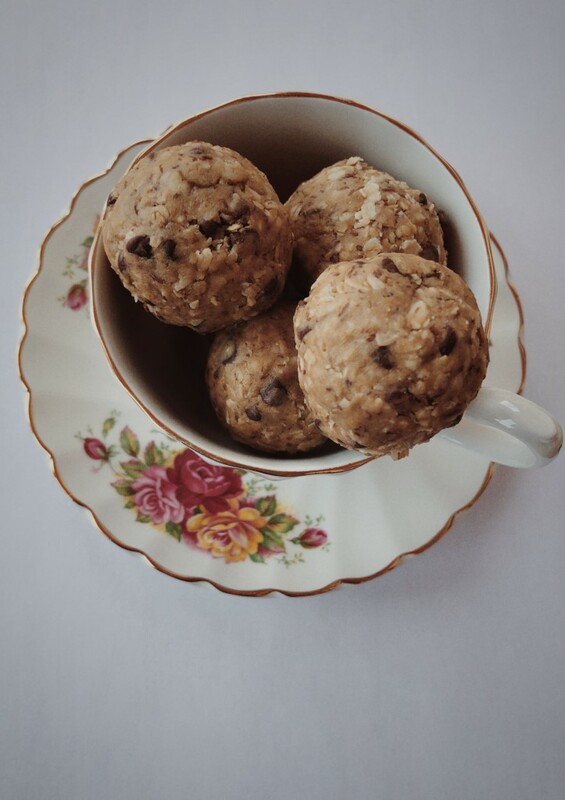 At my last Yoga for Childbirth workshop, these cookie dough bites were a huge hit! In a medium sized bowl, combine the dry ingredients, then add wet ingredients and mix well. I like to use a wooden spoon to start, and then knead with my hands before rolling into bite-sized balls. Great for a snack at home or on the go, and toddlers love them too!